ST. GEORGE – So what is the No. 1 issue the public asks St. George Mayor Jon Pike about when he’s out in the community? The answer is, “roads.” That’s what Pike said Friday morning during a presentation before prospective voters about Proposition 1, a ballot measure that would raise local sales tax by 0.25 percent for transportation infrastructure funding. About 70 people gathered at the Issues Over Eggs breakfast hosted by the St. George Area Chamber of Commerce to learn more about Proposition 1 and why Pike and other municipal officials feel it would be a benefit if passed. Funding allocated from the state to the county and cities through the state gas tax has been decreasing over the years. The tax rate remained the same between 1997 and 2015. In 2015, the Legislature raised the tax for the first time in nearly 20 years. The tax was increased by 5 cents per gallon of gasoline. Since 1997, cars have become more fuel-efficient or use alternative fuels instead of gasoline. This has resulted in less gas consumption and ultimately less funding for transportation projects. When the state gas tax was implemented in 2015, the Legislature also authorized a “local option sales tax” as a way to provide counties and cities with additional funding. However, this measure has to be approved by the voters. This is why civic leaders are hoping to educate the public about the ballot measure, Proposition 1. “That, to me, is the best thing we can do,” Pike said. The proposed sales tax of 0.25 percent equals 1 cent out of every $4 spent on nonfood items. 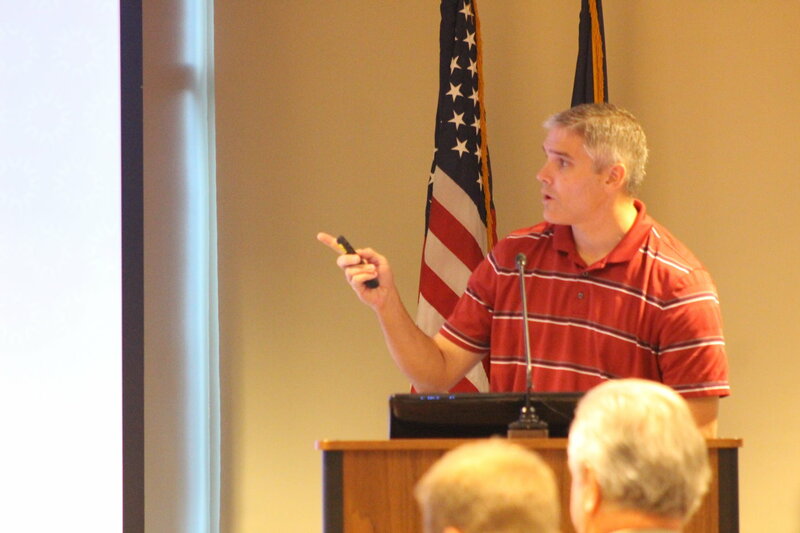 It is anticipated that 30 to 40 percent of that revenue will come from visitors to the county, Pike said. Possible uses for the funds include building new roads and expanding existing ones, as well as general maintenance and pavement preservation. Active transportation needs are also factored into the funding for trails, bike paths and related facilities. 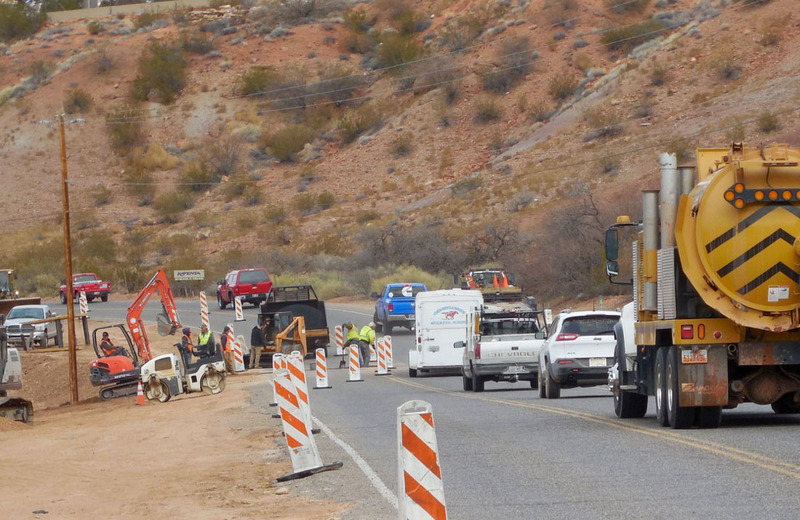 St. George could definitely use the funds, St. George Public Works Director Cameron Cutler said. The city has 362 miles of paved roads to maintain, with between five and 10 new miles added each year due to continued growth. “When you have a lot of roads in your city, you need to keep them up,” Cutler said. Currently, the city commits $2.2 million to pavement preservation. Myron Lee, director of the Dixie Metropolitan Planning Organization, said local governments do need to find more money for road facilities. “We’re seeing a great deal of congestion,” Lee said, adding that the county currently experiences 2,200 hours of traffic delays a day. The congestion is only going to get worse as the county grows, Lee said, but that can be alleviated somewhat through the funding Proposition 1 would provide. By 2040, the county is expected to have over 340,000 residents. If no new roads are added between now and then, Lee said daily traffic delays would reach 45,000 hours. If funding largely remains as it is now, delays will be around 19,000 hours a day. If Proposition 1 passes, it is projected that infrastructure bolstered by that funding will help cut delays to 10,000 hours by 2040. While expanding and maintaining roadways and related infrastructure is a primary point of Proposition 1, the measure also addresses public transit. The only public transit system in the county right now is SunTran, which is overseen by the City of St. George. 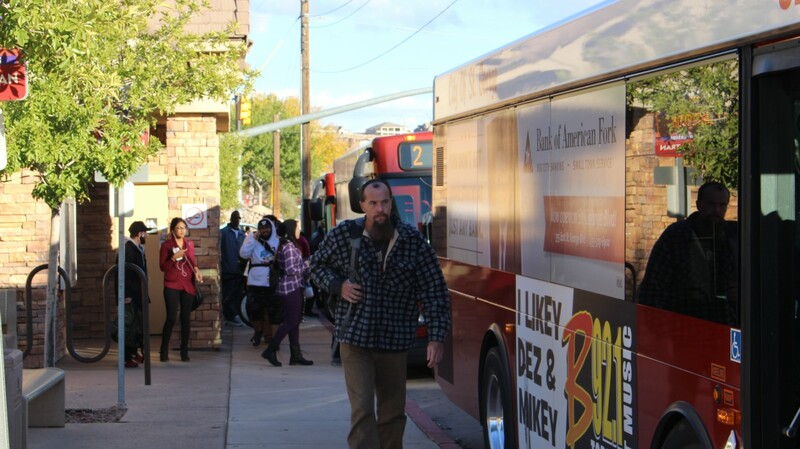 The current budget for the transit system is $1.7 million, a large part of which is subsidized through federal grants. SunTran primarily serves the St. George area, but has expanded into Ivins and ridership has grown every year since the service began in 2003. In its first year, SunTran had 66,000 riders. That number swelled to nearly 500,000 in 2015. According to a survey conducted earlier this year focused on improving SunTran service, riders showed a high level of satisfaction with the bus service but also requested expanded routes to Washington City and SunRiver. Riders also asked for buses to run on Sunday. Those are requests that could possibly be met in the future with funds garnered from the proposed sales tax increase, Pike said. 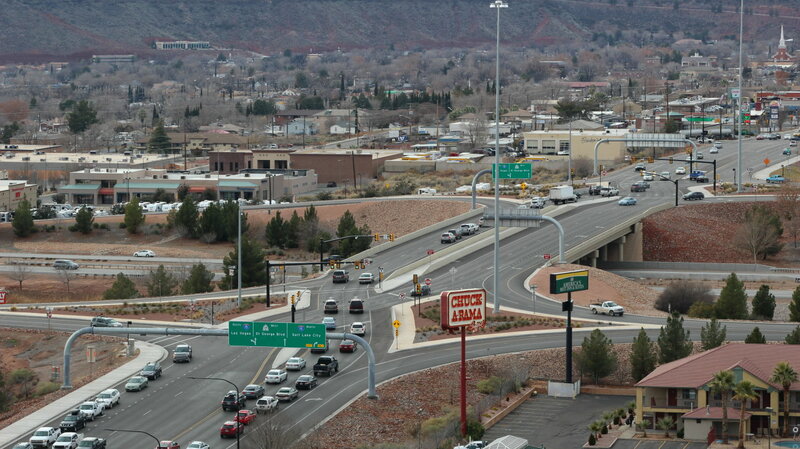 Funds from the 0.25 percent sales tax would essentially double SunTran’s budget St. George-based budget by providing an additional $1.6 million. 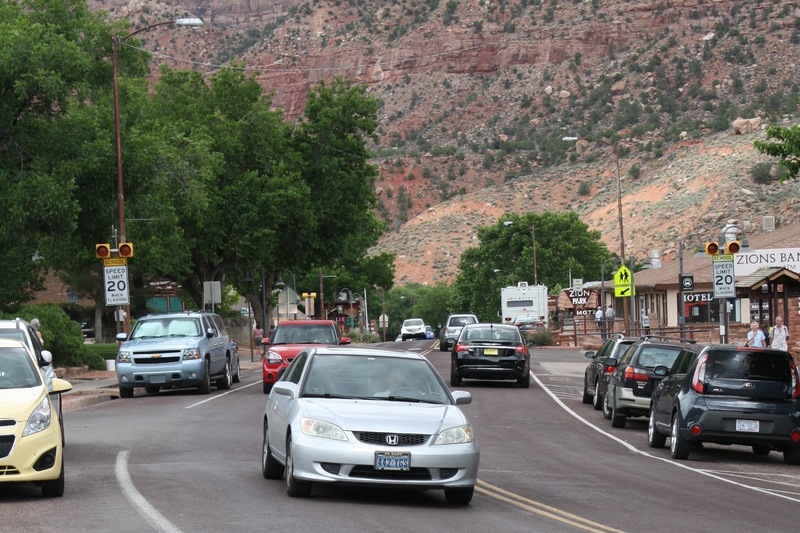 The potential funds for transit service could also help start expanded bus service to Zion National Park from St. George, Lee said. The possibility of service to Zion is being looked into by the Five County Association of Governments. While many in attendance at Friday’s presentation appeared in favor of the increased sales tax being used for roadway projects, providing funds to public transit wasn’t too appealing to others. St. George residents Don Tarinelli said he felt the funding to SunTran was too much. Although undecided on the ballot measure, Tarinelli said more money should go toward road maintenance. Pike is hopeful about the proposition. “I think it’ll pass, but I don’t think it’ll pass by a lot,” he said, comparing the measure to the 2014 RAP tax that passed with a close vote. If the measure fails to pass, Pike said the voters will have given the city its “marching orders.” That is to say: work with what you have. As such, certain projects will just take longer to get to, or not happen at all. The Washington County Commission will be holding a public hearing on Proposition 1 on Oct. 18 at 6 p.m., at the Washington County Administrative Building, 197 E. Tabernacle St. in St. George. Here a tax. There a tax. Everywhere is more and more tax! Did he really say that ? So the voters need to give permission to have more money to play with OR its all our fault. So it’s either play the game I want to play or I’m taking all my marbles and going home. Sheeesh. Good luck STG residents. with the thousands of new residents that relocate to the area every year and hugely expanded tax base each year we should absolutely not need tax increases in any area. can we please bring in a 3rd party to audit all these corrupt, wasteful mormon politicians..
How about cutting funds from the ‘extras’ and funding the important things like roads and water lines? If the ‘arts’ need more money- raise it like we used to have to do in the olden days- do a bake sale, host a talent show, put on a silent auction! This is exactly right. Elected officials need to focus on the proper role of government. The marching orders are: keep your eye on the ball! I’m ready for someone conservative to take Pike’s place. Keep your eye on the freaking ball, people! While not thrilled, I could live with a small tax increase geared towards our local needs. What I don’t get is the ‘St George-to-Zion Bus’ scheme. Think about it…Tourists stay overnight, get on I 15 in the morning and they’re gone. Others come by bus, stop at Harmon’s for sushi and they’re gone. Given this proposal, worst case, you get on a bus in St George, ride to Springdale, get on another bus that takes you to a third bus that takes you into the park. A little exaggeration maybe, but you get my point. I agree RealMcCoy. Just say NO. Government should do the things it must do and then maybe put it to the voters to fund this nice project or that nice project. Right now it’s the other way around. Lmao. ..notice how Bob tries to blame religion for raising taxes. Dot likes tax increases. He will be paying everyone’s taxes this year…..hes like Oprah you get tax break, you get a tax break, everyone gets a break from taxes! Yay Dot! But I am in favor of the Just moved to Oklahoma tax ! How about Mayor Pike resign his cushy IHC full-time job and try his hand a one the low paying jobs that the majority of the residents have to deal with? Same goes for all the other so-called “city officials”. What will they do when their personal (residents) ATM runs dry? I am fortunate to be retired and live off my pensions that I worked hared for. But I do feel for those young families and the elderly who are struggling to make ends meet. Yet the “city officials” feel no shame to come begging to the residents for more money. The residents have to live on what they make, so should the “cities”. Residents don’t have the luxury to go and ask (beg) for increases in wages, pensions, etc., like these “city officials” do. And they think nothing of it, likes its the residents obligation to dole out more money at the whim of begging “city officials”. I agree with the comments posted on here in opposition to the proposed increase in taxes. Come on Mayor Pike, go get a job at WalMart or KMart and try living on those wages. Can’t, you say? Well then you’ll just have to go work at WalMart AND KMart and possibly a third part-time job to make ends meet. How would you feel about tax increases then?? Just another WCWCD-like scheme. “City officials” must have been taking lessons from Ron Thompson on how to get money from the residents. VOTE NO ON PROP1 !!!!! Vote “NO” higher sales tax on Tuesday, November 8, 2016 because St. George residents are TAXED ENOUGH ALREADY! 1. Only 37% of the estimated 3.8 million additional dollars collected would be for roads. 2. Raising taxes makes St. George less competitive. Raising the sales tax effectively makes all goods more expensive: we all inevitably have less money to spend and save. 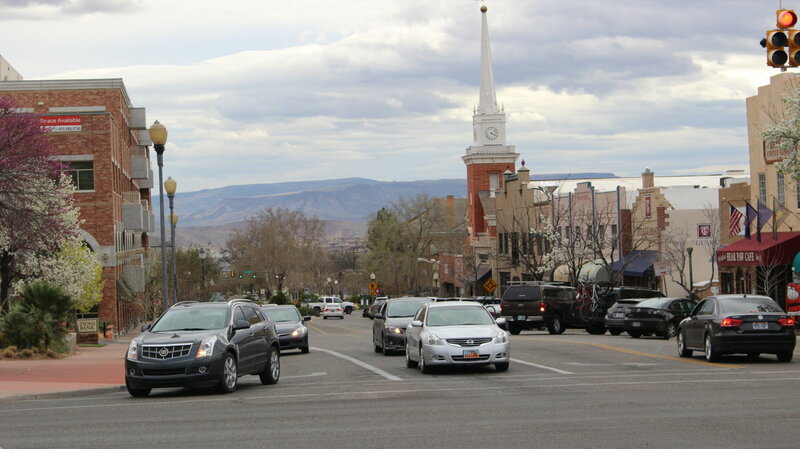 Essentially, it increases the cost of living in St. George – people need to earn more to live here – and this affects costs at all stages of production, distribution, sales, and service. Higher taxes hurt us all.